Ebu Adil, commander of the Manbij Military Council within the Syrian Democratic Forces, has told Sputnik that Turkey's Manbij-related threats have prompted the US to start strengthening its presence in the region. "By deploying additional special forces to the region, the US has expanded its existing military base in Manbij and established a new one on the front line. So right now, there are two American bases in [northern Syria's] Manbij region. Information about three such bases holds no water," Manbij Military Council commander Ebu Adil said. He explained that the move came after the US decided to strengthen its presence in the region following threats issued by Turkey. "After the Turkish forces attacked Afrin, representatives of the Manbij Military Council met the US military command and expressed serious concern about Turkey's possible military operation in the area," Adil said. His remarks came after Rezan Gilo, joint chief of defense in Syrian Kurdistan (Rojava), told Sputnik late last week that the international coalition led by the US is building new bases in northern Syria, including Manbij, which he said is part of the US-led coalition's cooperation with the Syrian Democratic Forces (SDF). 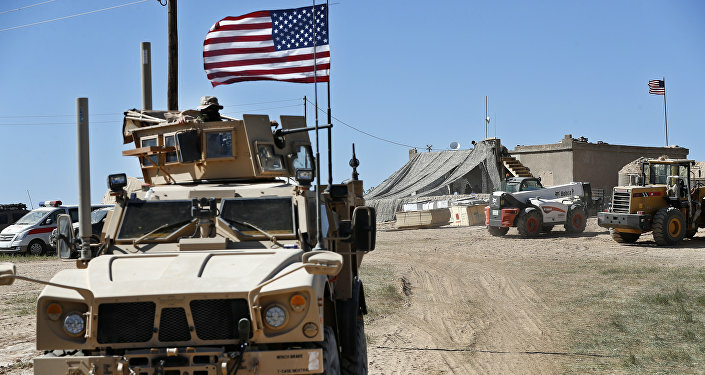 Earlier that week, Turkey's Anadolu news agency reported about the establishment of two bases in the Manbij region, citing the deployment of about 300 US soldiers as well as a spate of armored vehicles and construction machines to the area. Turkey aims to occupy Kurdish-held Manbij as part of its Operation Olive Branch, which kicked off on January 20, 2018. On March 28, the Turkish National Security Council warned that Ankara would push its operation in the northern district of Afrin further to Manbij, if the Kurdish People's Protection Units (YPG) forces supported by the United States did not leave the region. Citing security concerns, Turkish President Recep Tayyip Erdogan, for his part, earlier pledged to clear the Kurds from strategic regions located along the Syria-Turkey border. "I would like to repeat that unless we ensure security in all the regions controlled by the YPG, first of all, in Manbij, we will not stop," Erdogan stressed. Ankara has blacklisted then the YPG — the backbone of the SDF — as an affiliate of the Kurdistan Workers' Party (PKK), which is outlawed in Turkey as a terrorist organization. The US-led coalition has been launching air strikes on Syrian soil since 2014, in an anti-Daesh* mission that was approved neither by the Syrian government nor the UN. Right now, an estimated 2,000 US troops are deployed in this Arab country. The views and opinions expressed by Ebu Adil are those of the speaker and do not necessarily reflect those of Sputnik.